Mission - to provide distinctive, discreet advisory services on financial services policy and regulatory issues, including current U.S. reforms, G20 policy initiatives, and financial market competitiveness. 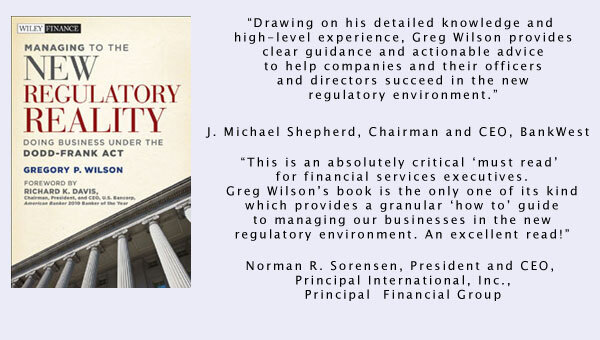 1Greg Wilson Consulting provides distinctive consulting services to a few selected clients on financial services policy and regulatory issues. With more than 30 years of professional experience in both the U.S. government and private sector consulting while a partner at McKinsey & Company, my current client service focuses on the aftermath of the financial crisis, U.S. and global regulatory reforms, and financial market competitiveness. In the past decade, I have worked in more than 25 countries in the developed world and emerging markets, enabling me to leverage distinguished experience from around the world with unique, tailored insights to help clients in the new regulatory reality. 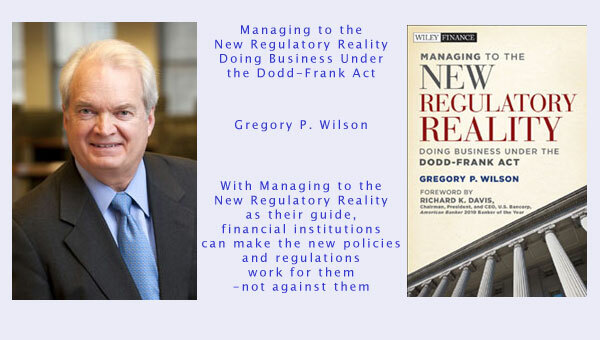 2Managing to the New Regulatory Reality – The year 2008 will be remembered forever in U.S. financial history as a transformational shift in terms of how the American political establishment views the financial services industry in this country. Its long-term implications are likely to have a negative impact on consumers, investors, economic growth, and jobs in the new regulatory reality unless that relationship is realigned with greater balance in mind for our economy. DANGEROUS MARKETS: Managing in Financial Crises – As the economy grows more global, the impact of financial crisis in any country has come to affect us all. Corporations fail, the stock market and currency values fall, deposits are at risk, pension plans are lost, and, in some cases, even civil unrest follows.